When deciding which thermal paper grade is right for you, it's important to consider the environment in which it will be used. The life of any thermal image may be reduced by exposure to heat, humidity, excessive light or contact with chemicals such as plasticizers, oils, solvents, adhesives, water, and some printing inks. If your receipt needs to be kept for a long period of time and winds up in your wallet or purse, on the dashboard of your car, or near a window exposing it to excessive ultraviolet (UV) light, you could have a problem maintaining the receipt's image if not caught in time. The chemistry combination of the thermal coating is sensitive to UV light and may exhibit some image degradation with extended exposure to office light, or shorter exposure to intense UV light. Some standard paper grades are more sensitive than others. The stability of the image will depend upon the degree to which the image was originally developed, and the intensity of the UV light and the character of UV (% of UV range in a light source). Background development may also occur with prolonged exposure to UV light. To increase environmental resistance or durability of thermal paper a top coat can be added. This top coat provides extra protection against mechanical stresses, exposure to chemicals or environmental effects. A coating on the back of the paper (back coat) provides additional protection during printing, laminating, and numerous other processes. This higher paper grade is available in various paper weights and thermal activation speeds. 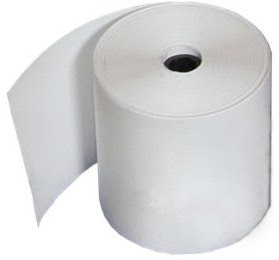 If your application puts this product in harsh conditions or your image needs to last, it would be worth looking into the different qualities of thermal paper available in the market.